Apple Unveils Three New iPhones, But The Watch Sends Shares Up : The Two-Way Apple is freeing the watch from the iPhone, giving it a direct cellphone connection. The special-release iPhone X ditches the home button, gets facial recognition and wireless charging. Early leaks of new designs had stirred anticipation for Apple's new smartphone — and on Tuesday Apple delivered on all the predictions with a $699 iPhone 8 and a $999 special-edition iPhone X (as in "10"). The 10th-anniversary iPhone is the biggest redesign in years, with an all-screen front that eliminates the home button and can use facial recognition to unlock the display. 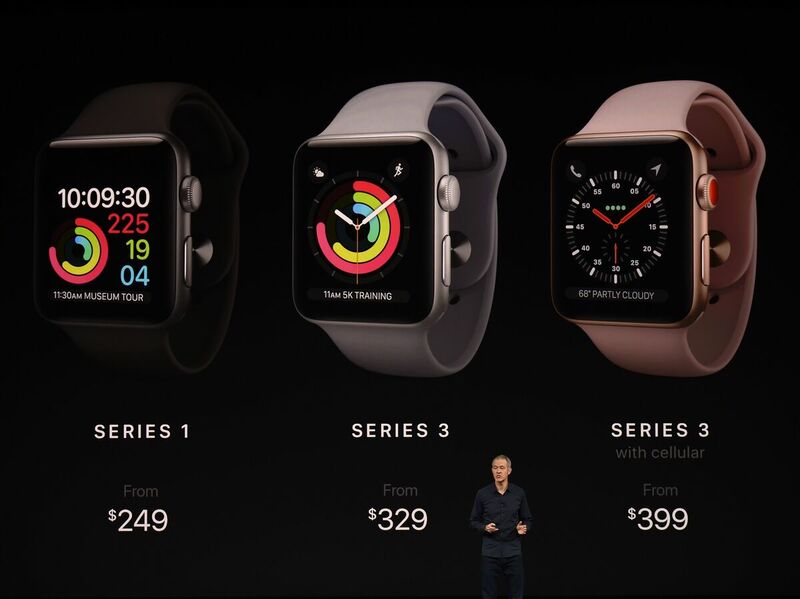 Apple has yet to release any actual sales numbers for the watch. But CEO Tim Cook says that the Apple Watch has now become "the No. 1" watch in the world — beating even traditional watchmakers like Rolex. 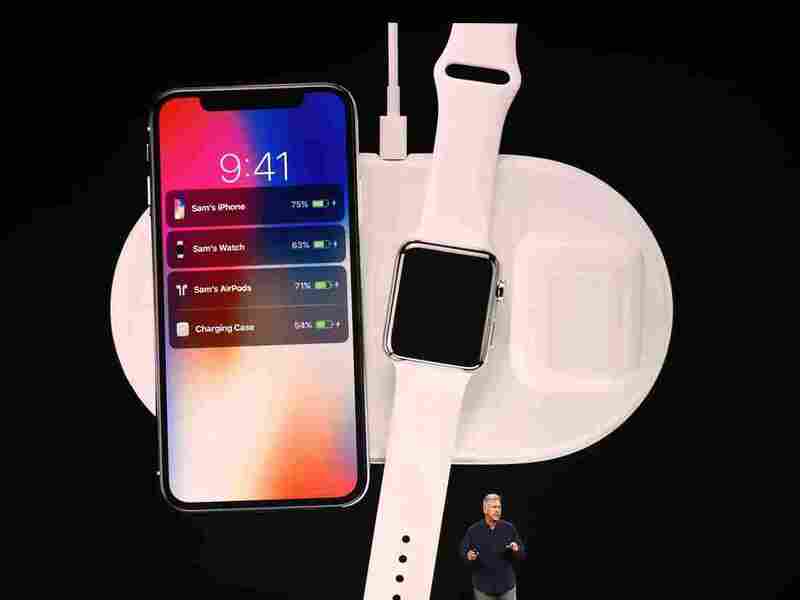 Where in the past Apple heavily touted its smartwatch as a gadget for the fitness-minded, Tuesday's presentation made an additional pitch for more broad uses, like errands or general health monitoring. Apple said it is working with medical researchers to test whether the watch can detect heart problems. Apple Chief Operating Officer Jeff Williams describes the new version of the Apple Watch at Apple's new headquarters in Cupertino, Calif. The new-generation iPhone was pitched as the next step in the evolution of the smartphone. "No other device in our lifetimes has had the impact on the world that the iPhone has," Cook said, noting this year's anniversary of the 2007 launch of the original iPhone. Apple analysts touted the new iPhones' impressive photo cameras and leaps in adapting to the display of augmented reality — digital images imposed over visuals of the real world. In some ways, Apple is also catching up to competition — it is finally adopting wireless charging for its devices and, on the iPhone X, ditching the staple home button in favor of a sleek screen that covers the full front. Apple is also switching the display to a brighter, sharper one called OLED — ironically, manufactured and propagated by Apple's most bitter rival, Samsung. 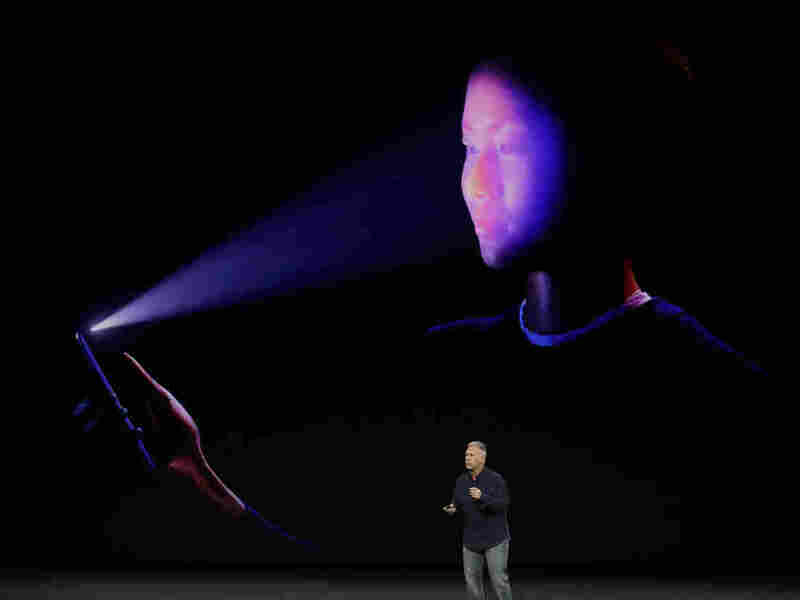 Apple's Schiller presents the iPhone's new facial-recognition feature, called Face ID. Apple is also not the first company to use facial recognition — some Windows laptops have a similar feature, for example. But Apple, with its massive devoted fan base, adds a new level of mainstream appeal. "Face ID learns your face. It learns who you are," said Apple executive Philip Schiller, describing how the camera will be able to tell whether the user has grown a beard, started wearing glasses or put on a hat. He also said Apple engineers worked to make sure that Face ID could not be tricked by a photograph or even a mask that looks like the user and would unlock the phone only when the user looks directly at it, eyes open.